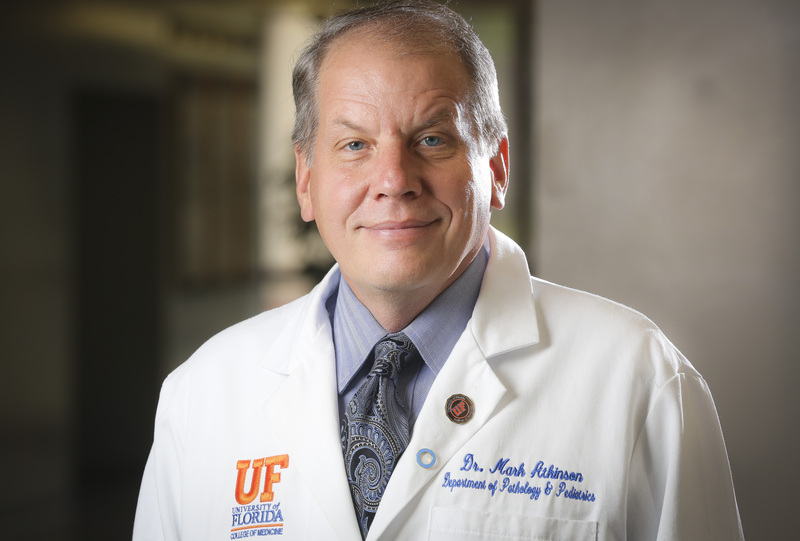 Home Faculty Experimental Pathology Mark A. Atkinson, Ph.D. Professor Atkinson’s research is broad in scope but directed at identifying a prevention and/or cure for Type 1 (i.e., insulin-dependent, juvenile) diabetes. The key to achieving this goal is an improved understanding of the interactions between environmental, immunologic, and genetic factors that underlie the inability to form immunological tolerance to the insulin secreting pancreatic beta cells. To achieve this goal, our laboratory seeks to directly define methods (e.g., immunointervention with self-antigens, gene therapy) for disease prevention in non-diabetic subjects identified to be at increased risk for the disease or diabetic subjects through pancreatic transplantation in association with novel forms of immunotherapy. Wang, M.; Racine, J.J.; Song, X.; Li, X.; Nair, I.; Liu, H.; Avakian-Mansoorian, A.; Johnston, H.F.; Liu, C.; Shen, C.; Atkinson, M.; Todorov, I.; Kandeel, F.; Forman, S.; Wilson, B.; Zeng, D.: Mixed Chimerism and Growth Factors Augment B-Cell Regeneration and Reverse Late-Stage Type 1 Diabetes. Science Translational Medicine 4:133ra59, 2012. Atkinson, M.A. ; Chervonsky, A.: The Role for the Gut Microbiota in Type 1 Diabetes? Early Evidence from Humans and Animal Models of the Disease. Diabetologia 11:2868-77, 2012. Campbell-Thompson, M.; Wasserfall, C.; Montgomery, E.L.; Atkinson, M.A. ; Kaddis, J.S. : Pancreas Organ Weight in Individuals with Disease-Associated Autoantibodies at Risk for Type 1 Diabetes. JAMA 308:2337-9, 2012. Zhang, Q.; Fillmore, T.L. ; Schepmoes, A.A.; Clauss, T.R.W. ; Crisenko, M.A. ; Mueller, P.W. ; Rewers, M.; Atkinson, M.A. ; Smith, R.D. ; Metz, T.O. : Serum proteomics reveals systemic dysregulation of innate immunity in type 1 diabetes. Journal Experimental Medicine 210:191-203, 2013. Staeva, T.P. ; Chatenoud, L.; Insel, R.; Atkinson, M.A. : Recent Lessons Learned From Prevention and Recent-Onset Type 1 Diabetes Immunotherapy Trials. Diabetes 62:9-17, 2013. Myhr, C.B. ; Hulme, M.A. ; Wasserfall, C.H. ; Hong, P.J. ; Lakshmi, P.S. ; Schatz, D.A. ; Haller, M.J.; Brusko, T.M. ; Atkinson, M.A. : The Autoimmune Disease-Associated SNP rs917997 of IL18RAP Controls IFNg Production by PBMC. Journal of Autoimmunity 44:8-12, 2013. Atkinson, M.A. ; Ogle, G.D.: Improving Diabetes Care in Resource-Poor Countries: Challenges and Opportunities. The Lancet, Diabetes & Endocrinology 1(4):268-70, 2013. Dunne, J.L. ; Triplett, E.W. ; Gevers, D.; Xavier, R.; Insel, R.; Danska, J.; Atkinson, M.A. : The Intestinal Microbiome in Type 1 Diabetes. Clinical and Experimental Immunology 177(1):30-7, 2014. Atkinson, M.; Eisenbarth, G.S., Michels, A.W. : Type I Diabetes. Lancet 383(9911):69-82, 2014. Kushner, J.A. ; MacDonald, P.E. ; Atkinson, M.: Stem Cells to Insulin Secreting Cells: Two Steps Forward and Now a Time to Pause? Cell Stem Cell 15(5):535-6, 2014. Haller, M.J.; Gitelman, S.E. ; Gottlieb, P.A. ; Michels, A.W. ; Rosenthal, S.M. ; Shuster, J.J.; Zou, B.; Brusko, T.M. ; Hulme, M.A. ; Wasserfall, C.H. ; Matthews, C.E. ; Atkinson, M.; Schatz, D.A. : Anti-Thymocyte Globulin/ G-CSF Treatment Preserves β Cell Function in Patients with Estbalished Type I Diabetes. Journal of Clinical Investigation 125(1):448-55, 2015. Battaglia, M.; Atkinson, M.: The Streetlight Effect in Type I Diabetes. Diabetes 64(4):1081-90, 2015. Kemppainen, K.; Ardissone, A.; Davis-Richardson, A.; Fagen, J.; Gano, K.; León-Novelo, L.; Vehik, K.; Casella, G.; Simell, O.; Ziegler, A.; Rewers, M.; Lernmark, Å.; Hagopian, W.; She, J.X. ; Krischer, J.; Akolkar, B.; Schatz, D.; Atkinson, M.; Triplett, E.; TEDDY Study Group. Early Childhood Gut Microbiomes Show Strong Geographic Differences Among Subjects at High Risk for Type I Diabetes. Diabetes Care 38(2):329-32, 2015. Atkinson, M.; Von Herrath, M.; Powers, A.C.; Clare-Salzler, M.: Current Concepts on the Pathogenesis of Type 1 Diabetes – Considerations for Attempts to Prevent and Reverse the Disease. Diabetes Care 38(6):979-88, 2015. Fuhrman, C.A. ; Yeh, W.I. ; Seay, H.; Lakshmi, P.S. ; Chopra, G.; Zhang, L.; Perry, D.J. ; McClymont, S.; Yadav, M.; Lopez, M.C. ; Baker, H.V. ; Zhang, Y.; Li, Y.; Whitley, M.; Von Schack, D.; Atkinson, M.; Bluestone, J.A. ; Brusko, T.: Divergent Phenotypes of Human Regulatory T-Cells Expressing the Receptors TIGIT and CD226. The Journal of Immunology, 195(1):145-55, 2015. Campbell-Thompson, M.; Kaddis, J.S. ; Wasserfall, C.H. ; Haller, M.J.; Pugliese, A.; Schatz, D.A. ; Shuster, J.S. ; Atkinson, M.A. ; The Influence of Type 1 Diabetes on Pancreatic Weight. Diabetologia, 59(1):217-21, 2016. Song, X.; Posgai, A.; Wasserfall, C.H. ; Myhr, C.; Campbell-Thompson, M.; Mathews, C.E. ; Rabinovitch, A.; Savinov, A.; Battaglia, M.; Schatz, D.; Haller, M.J.; Atkinson, M.A. : Combination Therapy Reverses Hyperglycemia in NOD Mice with Established Type 1 Diabetes. Diabetes, 64(11): 3873-84, 2015. Campbell-Thompson, M.; Fu, A.; Kaddis, J.S. ; Wasserfall, C.H. ; Schatz, D.; Pugliese, A.; Atkinson, M.A. : Insulitis and β-Cell Mass in the Natural History of Type 1 Diabetes. Diabetes, 65(3):719-31 2016.